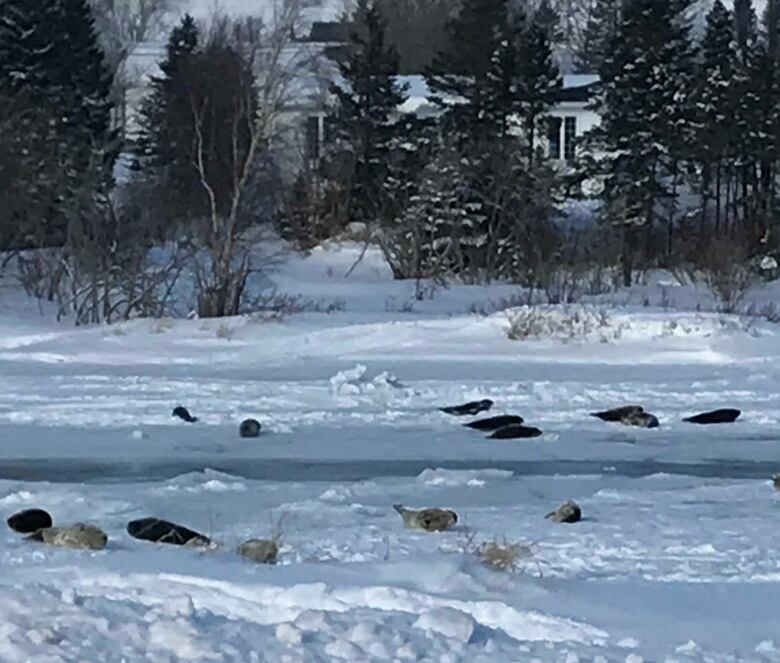 The mayor of Roddickton-Bide Arm says 40 or more seals have been spotted all over town, and she's concerned for their safety. Police in Roddickton-Bide Arm, N.L. — the community that at least 40 seals are currently calling home — have confirmed that two of the mammals have died. A spokesperson for the RCMP said officers responded to a complaint Wednesday morning, and on arriving at the scene, they found employees from Department of Fisheries and Oceans were there as well. Police believe the seal deaths are not criminal and likely due to their having been struck by a car. 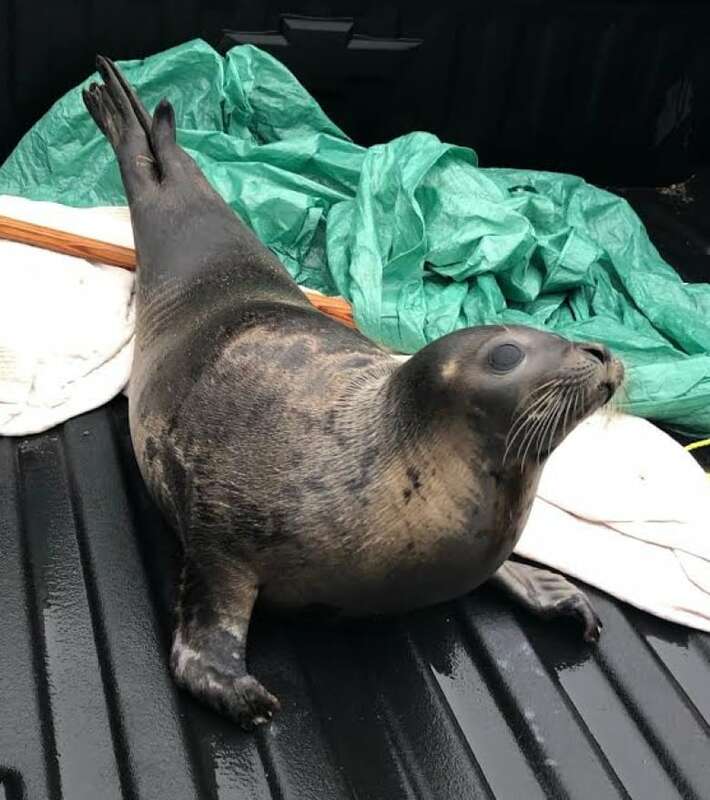 Mayor Sheila Fitzgerald said the seals' grey coats blend in with the road, and the town has had several calls from drivers who've had near misses. "It actually feels like we're being inundated with seals, because there's seals on the road, there's seals in people's driveways, the backyards, the parking lots, the doorways, the businesses. "I don't see that there's any way that these seals are going to survive unless [DFO officers] pick them up and literally bring them back to the edge of the ice." Fitzgerald fears the seals are too confused to find their way out of town. "They're pitiful to look at. I mean, they haven't eaten," Fitzgerald said. 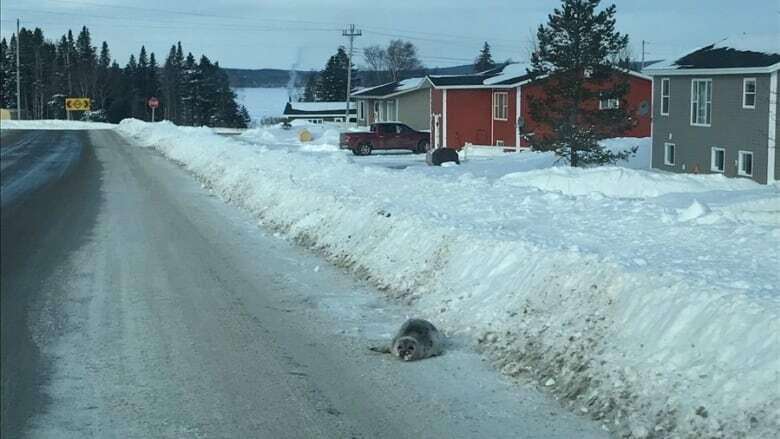 They might look a little out of place scooting down the streets of Roddickton-Bide Arm, but a Department of Fisheries and Oceans scientist says it's not unusual to see harp seals come ashore in Newfoundland this time of year. "We get this every year," said Garry Stenson. "If it's near a town you hear more about it, but it's not totally uncommon for us to get this." Roddickton-Bide Arm is about 450 kilometres northwest of St. John's as the crow flies, near the northern tip of the island. Harp seals migrate south from the Arctic starting in December, Stenson explained. They spend their winters off the shores of Newfoundland and Labrador. This early in the season, there's little sea ice off the island, so seals cling close to the shore, traversing iced-in harbours and bays, which freeze before the open ocean. "Then if the ice freezes up behind them, they have a harder time getting access to water," he said. "They really don't know which way to go." "It's almost like they get going in a direction and just keep going, hoping that they're going to eventually find water that way," he said. "Usually they find their way back fine." He said the officers will meet with DFO scientists "in the next few days" to determine the next steps. DFO has returned individual seals to open water in the past. "But generally, if they're just lying on a beach or on a slipway or that sort of thing, you just leave them on their own." Stenson is confident the seals will eventually get their bearings, but until they do he said people should keep their distance — don't go in for any seal selfies. "Don't go up to them," he said. "Harp seals are not particularly aggressive, but they can be if they're being approached. So your best bet is to call your local fishery officer."